Here’s a random fact: cracks don’t form instantaneously in glass as it shatters, despite what it looks like. In fact, I’ve learned that cracks form in matter around (or just below) the speed of sound in that material. Remember your junior high science lessons: sound moves faster through liquids and solids than it does through air. Thus, the speed of sound in glass is much higher than it is in air. I’ve found estimates for the speed of sound in glass ranging from 4,000 meters per second to 5,000 m/s. This means that cracks in glass form at around 4-5,000 m/s! I think about this every time I crack open a bottle. 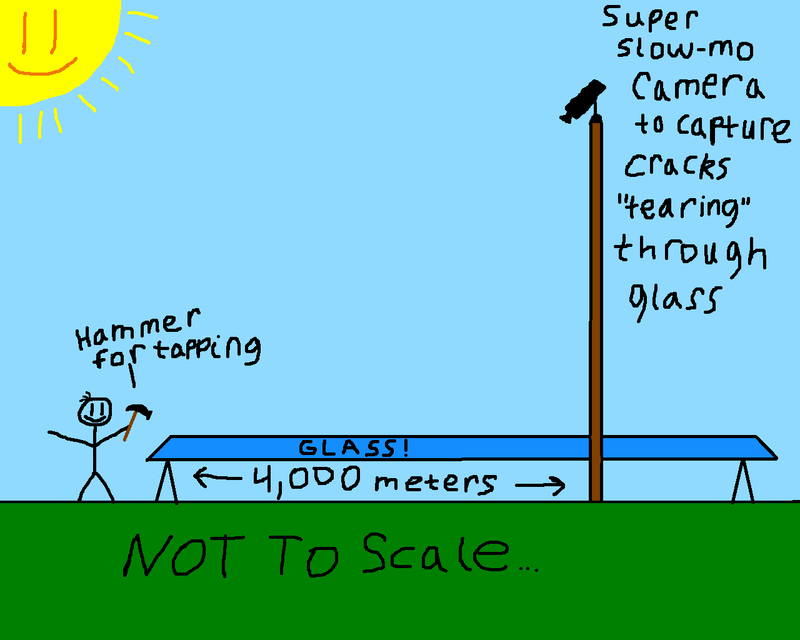 So, if I had a sheet of glass 4,000 meters long…does that mean I could tap it on one end with a hammer and watch the crack “tear” along it for one full second until it reached the other end? You are a true bottleosopher. We need a really big piece of glass & Chuck Yeager.